It’s just a $5,812,353 contract — chump change for the Pentagon — and not even one of those notorious “no-bid” contracts either. Ninety-eight bids were solicited by the Army Corps of Engineers and 12 were received before the contract was awarded this May 28th to Wintara, Inc. of Fort Washington, Maryland, for “replacement facilities for Forward Operating Base Speicher, Iraq.” According to a Department of Defense press release, the work on those “facilities” to be replaced at the base near Saddam Hussein’s hometown, Tikrit, is expected to be completed by January 31, 2009, a mere 11 days after a new president enters the Oval Office. It is but one modest reminder that, when the next administration hits Washington, American bases in Iraq, large and small, will still be undergoing the sort of repair and upgrading that has been ongoing for years. In fact, in the last five-plus years, untold billions of taxpayer dollars have been spent on the construction and upgrading of those bases. When asked back in the fall of 2003, only months after Baghdad fell to U.S. troops, Lt. Col. David Holt, the Army engineer then “tasked with facilities development” in Iraq, proudly indicated that “several billion dollars” had already been invested in those fast-rising bases. Even then, he was suitably amazed, commenting that “the numbers are staggering.” Imagine what he might have said, barely two and a half years later, when the U.S. reportedly had 106 bases, mega to micro, all across the country. By now, billions have evidently gone into single massive mega-bases like the U.S. air base at Balad, about 60 miles north of Baghdad. It’s a “16-square-mile fortress,” housing perhaps 40,000 U.S. troops, contractors, special ops types, and Defense Department employees. As the Washington Post’s Tom Ricks, who visited Balad back in 2006, pointed out — in a rare piece on one of our mega-bases — it’s essentially “a small American town smack in the middle of the most hostile part of Iraq.” Back then, air traffic at the base was already being compared to Chicago’s O’Hare International or London’s Heathrow — and keep in mind that Balad has been steadily upgraded ever since to support an “air surge” that, unlike the President’s 2007 “surge” of 30,000 ground troops, has yet to end. Now, imagine as well that hundreds of thousands of Americans have passed through these mega-bases, including the enormous al-Asad Air Base (sardonically nicknamed “Camp Cupcake” for its amenities) in the Western desert of Iraq, and the ill-named (or never renamed) Camp Victory on the edge of Baghdad. Troops have surged through these bases, of course. Private contractors galore. Hired guns. Pentagon officials. Military commanders. Top administration figures. Visiting Congressional delegations. Presidential candidates. And, of course, the journalists. It has been, for instance, a commonplace of these years to see a TV correspondent reporting on the situation in Iraq, or what the American military had to say about Iraq, from Baghdad’s enormous Camp Victory. And yet, if you think about it, that camera, photographing ABC’s fine reporter Martha Raddatz or other reporters on similar stop-overs, never pans across the base itself. You don’t even get a glimpse, unless you have access to homemade G.I. videos or Pentagon-produced propaganda. Similarly, last year, the President landed at Camp Cupcake for a meeting with Iraqi Prime Minister Nouri al-Maliki with reporters in tow. You could see shots of him getting off the plane (just as he does everywhere), goofing around with troops, or shaking hands with the Iraqi prime minister but, as far as I know, none of the reporters with him stayed on to give us a view of the base itself. Imagine if just about no one knew that the pyramids had been built. Ditto the Great Wall of China. The Hanging Gardens of Babylon. The Coliseum. The Eiffel Tower. The Statue of Liberty. Or any other architectural wonder of the world you’d care to mention. After all, these giant bases, rising from the smashed birthplace of Western civilization, were not only built on (and sometimes out of bits of) the ancient ruins of that land, but are functionally modern ziggurats. They are the cherished monuments of the Bush administration. Even though its spokespeople have regularly refused to use the word “permanent” in relation to them — in fact, in relation to any U.S. base on the planet — they have been built to long outlast the Bush administration itself. They were, in fact, clearly meant to be key garrisons of a Pax Americana in the Middle East for generations to come. And, not surprisingly, they reek of permanency. They are the unavoidable essence — unless, like most Americans, you don’t know they’re there — of Bush administration planning in Iraq. Without them, no discussion of Iraq policy in this country really makes sense. And that, of course, is what makes their missing-in-action quality on the American landscape so striking. Yes, a couple of good American reporters have written pieces about one or two of them, but most Americans, as we know, get their news from television and — though no one can watch all the news that flows, 24/7, into American living rooms, it’s a reasonable bet that a staggering percentage of Americans have never had the opportunity to see the remarkable structures their tax dollars have paid for, and continue to pay for, in occupied Iraq. This is the sort of thing you might expect of Bush-style offshore prisons, or gulags, or concentration camps. And yet Americans have regularly and repeatedly seen what Guantanamo looks like. They have seen something of what Abu Ghraib prison in Iraq looks like. But not the bases. Perhaps one explanation lies in this: On rare occasions when Americans are asked by pollsters whether they want “permanent bases” in Iraq, significant majorities answer in the negative. You can only assume that, as on many other subjects, the Bush administration preferred to fly under the radar screen on this one — and the media generally concurred. The growing Iraqi protests — in the streets, in parliament, and among the negotiators — certainly helped spark coverage in this country. A persistent and intrepid British reporter, Patrick Cockburn of The Independent, helpfully broke the story of Bush administration demands days before it became significant news here. But most of the credit should really go to the Bush administration itself, which, despite the long-term flow of events in Iraq, still wanted it all. Greed, coupled with desperation, seems to have done the trick. In all the years of the occupation, the officials of this administration have had a tin ear for the post-colonial era they inhabit. It’s never penetrated their consciousness that the greatest story of the twentieth century was the way previously subjected and colonized peoples had gained (or regained) their sovereignty. The administration indicated this, back in 2003, with its very dream of garrisoning a major, potentially hostile, intensely nationalistic Arab nation in the heart of the oil lands of the planet. That the building of enormous American bases and the basing of troops in relatively peaceful Saudi Arabia after the First Gulf War led to disaster — think: Osama bin Laden — mattered not a whit to top administration officials. It couldn’t have been clearer just how little they cared for Iraqi sovereignty or pride when L. Paul Bremer III, George W. Bush’s personal representative and viceroy in Baghdad, before officially “returning sovereignty” to the Iraqis in June 2004, signed the infamous (though, in this country, little noted) Order 17. As the law of the land in Iraq, among other things, it ensured that all foreigners involved in the occupation project would be granted “freedom of movement without delay throughout Iraq,” and neither their vessels, nor their vehicles, nor their aircraft would be “subject to registration, licensing or inspection by the [Iraqi] Government.” Nor in traveling would foreign diplomats, soldiers, consultants, security guards, or any of their vehicles, vessels, or planes be subject to “dues, tolls, or charges, including landing and parking fees,” and so on. When it came to imports, including “controlled substances,” there were to be no customs fees or inspections, taxes, or much of anything else; nor was there to be the slightest charge for the use of Iraqi “headquarters, camps, and other premises” occupied, nor for the use of electricity, water, or other utilities. And all private contractors were to have total immunity from prosecution anywhere in the country. This was, of course, freedom as theft. Order 17 would have seemed familiar to any nineteenth century European colonialist. It granted what used to be termed “extraterritoriality” to Americans. Think of it as a giant get-out-of-jail-free card for an occupying nation. They also evidently insisted on control over Iraqi air space up to 29,000 feet, the right to bring troops in and out of the country without informing the Iraqis, and the right to “conduct military operations in Iraq and to detain individuals when necessary for imperative reasons of security,” again without notification to the Iraqis, no less approval of any sort. They may even have insisted on the freedom to strike other countries from their Iraqi bases, again without consultation or approval. In addition, reported Cockburn, they were attempting to force their Iraqi counterparts to agree to such a deal by threatening to deny them at least $20 billion in Iraqi oil funds on deposit in the Federal Reserve Bank of New York. 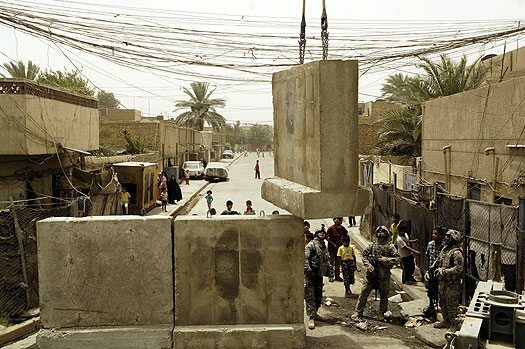 Had the Bush administration exhibited the slightest constraint, they might have constructed a far more cosmetic version of the permanent garrisoning of Iraq. They might have officially turned the mega-bases over to the Iraqis and leased them back for next to nothing. They could have let the stunning facts they had built on the ground speak for themselves. They could have offered “joint commands” and other palliative remedies (as they are now evidently considering doing) that would have made their long-term sovereignty grab look far less significant — without necessarily being so. But their ability to strategize outside the (Bush) box has long been limited. Think of them as “the me generation” on steroids, going global and imperial. Or give them credit for consistency. They’re mad dreamers who still can’t wake up, even when they find themselves in a roomful of smelling salts. Not surprisingly, this episode, too, is threatening to end in debacle. The Iraqi leadership is in virtual revolt. Across the political spectrum, as Tony Karon of the Rootless Cosmopolitan blog has written, the negotiations have forced upon the Iraqis “a kind of snap survey or straw poll… on the long-term U.S. presence, and goals for Iraq” from which the Americans are likely to emerge the losers. The idea of timetables for American departure is again being floated in Iraq. According to Reuters, “A majority of the Iraqi parliament has written to Congress rejecting a long-term security deal with Washington if it is not linked to a requirement that U.S. forces leave,” and unnamed American officials are now beginning to mutter about no SOFA deal being achieved before the Bush administration leaves office. The Sadrists are in the streets protesting the American presence and their leader has just called for a “new militia offensive” against U.S. forces. The pro-Iranian, but American-backed, Badrists are outraged. (“Is there sovereignty for Iraq — or isn’t there? If it is left to [the Bush administration], they would ask for immunity even for the American dogs.”) The Iranians are vehemently voting no. Opinion in the region, whether Shiite or Sunni, seems to be following suit. The U.S. Congress is up in arms, demanding more information and possibly heading for hearings on the SOFA agreement and the bases. Presidential candidate Barack Obama has insisted that any deal be submitted to Congress, the very thing the Bush administration has organized for more than a year to avoid. And miracle of all miracles, the mainstream media is finally writing about the bases as if they mattered. Someday, before this is over, all of us may actually see what was built in our names with our dollars. That will be a shock, especially when you consider what the Bush administration has proved incapable of building, or rebuilding, in New Orleans and elsewhere in this country. In the meantime, the President appears headed for yet another self-inflicted defeat. Tom Engelhardt, co-founder of the American Empire Project, runs the Nation Institute’s TomDispatch.com. The World According to TomDispatch: America in the New Age of Empire (Verso, 2008), a collection of some of the best pieces from his site, has just been published. Focusing on what the mainstream media hasn’t covered, it is an alternative history of the mad Bush years. A brief video in which Engelhardt discusses the American mega-bases in Iraq can be viewed by clicking here.